If you were walking in the country-side and came across the blackthorn shrub (which grows wild in the UK) you would be forgiven for thinking it was a blueberry bush. The blue berries of these two plants are remarkable similar however make no mistake they are not one in the same. Where the blue berry is used in muffins and puddings the blackthorn berry is a key ingredient in sloe gin. The blackthorn berry though very bitter when young can be eaten. Used in jams or marmalades it can help to reduce indigestion and control stomach discomfort. The blackthorn flower has other medicinal benefits. Brew the petals in boiling water for 10 minutes, strain and drink one cup in the morning and evening for a natural laxative or diuretic. 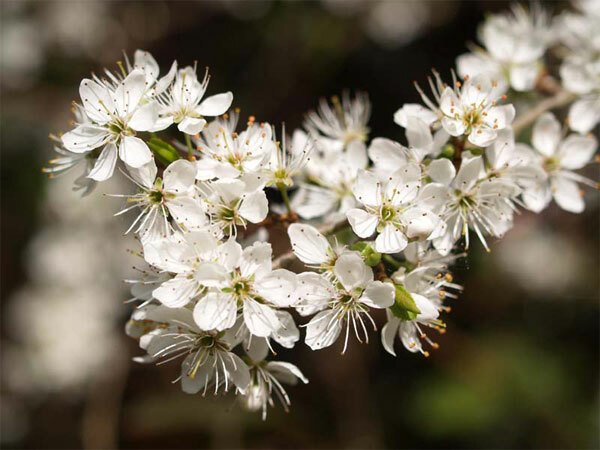 Using the blackthorn leaves instead of the flower creates a soothing mouthwash to relieve a sore throat or inflamed tonsils and general oral health. Skin care products like body oils and body washes that use the herb extract of the blackthorn can improve skin tone and elasticity. The blackthorn has strong astringent properties. Its bark can be used as a nerve tonic to soothe the body after increased stresses. Drinking water infused with the bark will have a calming effect.